I cound hardly contain my excitement when I stumbled upon a young beetroot leaves only salad mix at Sydney Fish Market’s Wasterside Fruit Connection green grocer. I picked up a pack along with a bunch of young beetroot, and finally, my craving for a young beetroot soup could be satisfied. 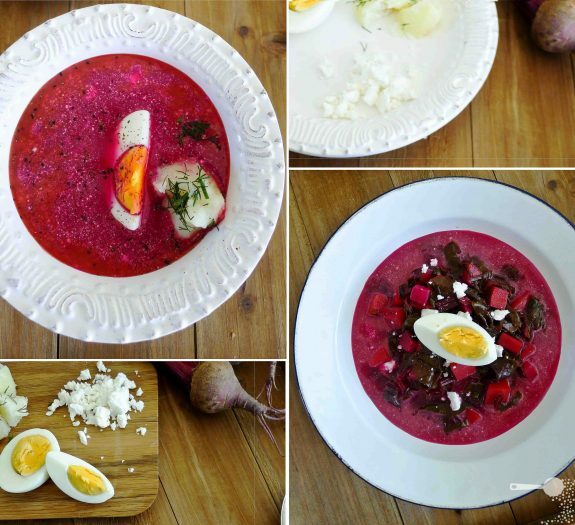 The allure of crimson in the soup – a traditional spring offering across most of Eastern Europe, is matched by the intense flavour of beets and a playful sweet and sour taste. Perhaps because of its peasant origins, the recipe lets nothing go to waste. You get to use the lot: the root, the stems and the greens. Thickened with a dollop of cream, the soup can be served 2 ways and the following recipe allows for you to try both. 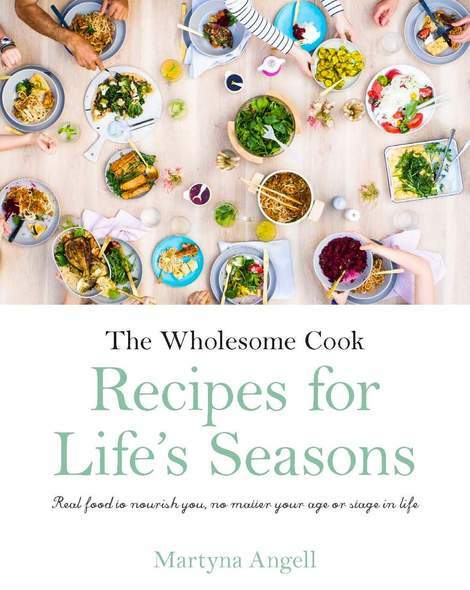 Firstly, it can be served more like a hearty winter stew, showcasing all the gorgeous vegetables and greens. The other option is to serve just the broth – a version much preferred during warmer months. Both go well with a side of hard boiled egg or young boiled potato sprinkled with dill. Being a great fan of the beetroot and goat’s cheese combo, I like to crumble some goat’s cheese feta into either of the versions and in addition to the other toppings. Lastly, to lift the soup a little further I added a good splash of apple cider vinegar. Yum! Heat oil in a large stockpot. Add peeled beetroot (but not the stems or leaves yet), carrots, parsnip and celery and allow to heat through. Add stock and water, bring to a boil and cook for 15 minutes. At this stage, add beetroot stems, leaves and baby beetroot leaves. Season with lemon juice or vinegar mic, sugar, salt and pepper. Cook for a further 5-10 minutes then turn off the heat. In a separate bowl, mix 1/2 cup of the broth with the sour cream until smooth and add to the pot, stir through to combine. To serve the soup "stew-style": ladle vegetables into a bowl and add enough broth to come up halfway up the veg. Serve with a side of boiled eggs, potatoes with dill and crumbed goat's feta. To serve the soup "broth-style": strain soup through a sieve into a bowl. Serve with a side of boiled eggs, potatoes with dill and crumbed goat's feta. Love the versatility of this soup, thanks for the recipe! That has to be the world’s prettiest soup! Thanks! Mr Chipconnoisseur said quite the opposite: “looks like someone died in making this soup?” but he thoroughly enjoyed it. Beautiful beautiful beautiful! And with goats fetta and dill? Perfection. Thanks Heidi, it’s good, isn’t it? Such a fantastic share. I’m a lover of all things beets, but besides my rotations of beet-inspired salads I’m afraid my repertoire isn’t all that expansive. Now I have something beautiful and beet-filled to look forward to! Thank you. Sounds sublime. 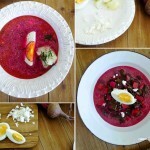 You might want to give my beetroot gazpacho a try http://wp.me/pYWFU-3b. Great stuff. I have a profound love of borscht, eating it since I was only little. These days I do the cooking and I love putting my own spin on it (my grandma wouldn’t add dill, or cheese for instance). I get young beets delivered in my vegbox and I always discard the leaves, next time I’ll hang on to them! Isn’t that just the greatest thing about cooking? How recipes evolve and change a little with the times – when I told Mum about goat’s cheese she loved it eventhough she’s only ever had egg and dill potato in hers! Mmm, that looks delicious! I love borscht but I’ve never used the tops in my soup. Sounds so yummy! It’s a great way to add body to the soup, and least wasteful! This is my boyfriend’s favorite soup! Thanks for your comment Kat, and I’ll pop around to visit your blog. Always keen to read about others’ food adventures! What a vibrant coloured soup! I’m a big fan of beetroot (especially served raw and crunchy) but am yet to try beetroot soup, so thanks for posting. this is one of my favorite soups ever. I just made something similar last week. I really like the addition of feta! Making this again this year for Christmas Eve. Everyone loved it last year! Hi Teresa, I’ve made it too! Will serve with sauerkraut dumplings. Wishing you and your family a very merry Christmas! Merry Christmas to you and your family also Martyna! Wesolych Swiat!